The first step in dealing with a problem is admitting you have a problem. I wonder if this is using the very inaccurate school shootings study released by Everytown. Just like a gun loon to deny the facts and claim the study is false. Of course you don't know (I wonder) but that won't stop you from making such claims. Actually we have no idea where the numbers came from, so they could quite easily be made up. No source equals no trust. Yeah, ss, being picky over the number is to deny the obvious point. The Daily Mail reports that new government data points to increased violence in British schools. The trend has even spread to primary schools, where the number of student suspensions due to violence against teachers has surpassed those in secondary schools. The statistics for 2011 show that 8,030 students were suspended or otherwise sanctioned for violence over the 2010-11 academic year — an increase of 15% over four years. The South East of England is reporting an especially sharp spike, with a 41% increase over the same period. Yet according to teachers unions, the true number could be even greater due to the fact that teachers are frequently pressured by their heads not to report incidents. This is done in order to preserve a school’s good name and not damage its showing on the country league tables. The United Kingdom stands a good chance of matching our own unprecedented school violence and mass shooting numbers. Thank God! What a vindication! And all of these last five years I thought it was only the United States Collective that had lost its mind!?! WTF was I thinking?!? Insanity belongs to any thinking and breathing individual! What a relief. Not one school shooting? What's your point? Yeah, Orlin, what was your point? My point? It should be obvious. And by your responses it is clearly obvious you don't really care about school violence. The only time you parrots start squawking is if a gun is involved, otherwise we find you sleeping in your cages with dirty, day-old newspapers. 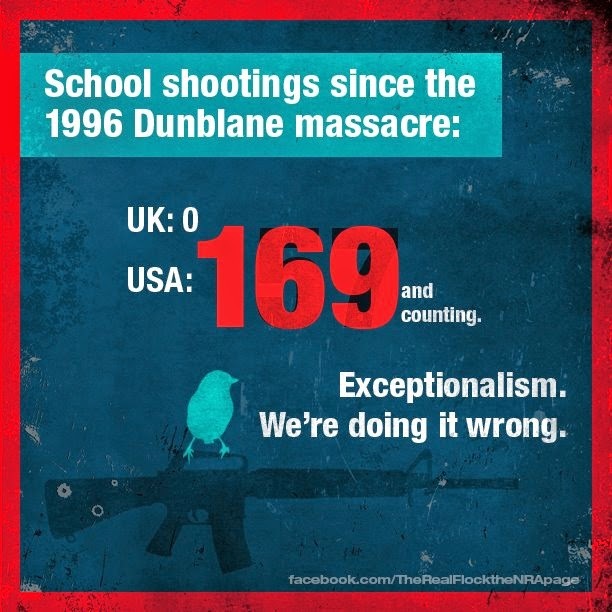 The only thing obvious is that UK's gun laws are preventing school shootings. Okay, so you condone violence, I understand. So, in your view, having a consistent position against any and all types of violence and aggression is idiotic. Thank you for that. Hey dummy, this post is about gun violence in schools and your information ONLY talked about non gun violence in schools. You get taken to task for your diversion, then claim I'm against your position of being against violence in schools. Is that the best you got? Dishonest garbage. Time you go back to school. Why do gun loons lie?